The 6th Annual March Of Dimes Celebration Of Babies awards luncheon which was held on Friday, December 2, 2011 at the Beverly Hills Hotel raised nearly $1 million. The Today Show’s Natalie Morales served as the Celebration of Babies program host. The Celebration of Babies event honored three individuals who exemplify the March of Dimes commitment to improving the health of babies by helping moms have healthy, full-term pregnancies. Actress Jeanne Tripplehorn presented Donna Langley, Co-Chairman of Universal Pictures, with the March of Dimes Grace Kelly Award, which is bestowed upon a woman who shares the March of Dimes commitment to healthy pregnancies and thriving babies. Dr. Jonathan E. Fielding, Director of the Los Angeles County Department of Public Health and County Health Officer, received the Celebration of Babies Community Award, which honors an exceptional doctor who represents the values and beliefs of March of Dimes by reaching out to moms and families in the community in support of a day when all babies are born strong and healthy. Pediatricians Dr. Scott Cohen & Dr. Bess Raker of Beverly Hills Pediatrics received the Golden Rattle award, which is given to those who advocate for babies and who share the March of Dimes goal that every baby be given a healthy start. Celebration of Babies also recognized prominent individuals, including Hollywood moms and dads, who are not only celebrating the birth of their children but who are March of Dimes role models for their commitment to improving the health of babies. These individuals, who have had or are expecting babies in 2011, made up the 2011 March of Dimes Celebrity Volunteer Stork Club: Jessica Alba, Connie Britton, Linda Cardellini, Diablo Cody, Rebecca Gayheart-Dane, Susan Downey, Sarah Drew, Mary Elizabeth Ellis, Jennifer Garner, Bryce Dallas Howard, Jewel, Alyssa Milano, Autumn Reeser, and Marley Shelton. Members of the “Stork Club” who attended the luncheon included Jessica Alba, Linda Cardellini & Steven Rodriguez, Diablo Cody, Susan & Robert Downey Jr, and Autumn Reeser & Jesse Warren. 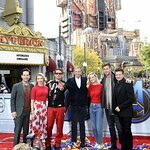 Additional celebrity guests included Russell Crowe, Jenna Fischer, Brian Grazer, Thomas Ian Nicholas, Amanda Seyfried, Molly Sims, and Jeanne Tripplehorn. Through research, education, advocacy, and community programs, March of Dimes is a champion for the health of all babies. For more than 70 years, March of Dimes has enjoyed a rich history of Hollywood celebrity support. Stars like Louis Armstrong, Lucille Ball, Tom Bergeron, Julie Bowen, Grace Kelly, Marilyn Monroe, Elvis Presley, Frank Sinatra, Thalia and many others have volunteered for March of Dimes lifesaving campaigns. March of Dimes is the leading nonprofit organization for pregnancy and baby health. With chapters nationwide, March of Dimes works to improve the health of babies by preventing birth defects, premature birth and infant mortality.